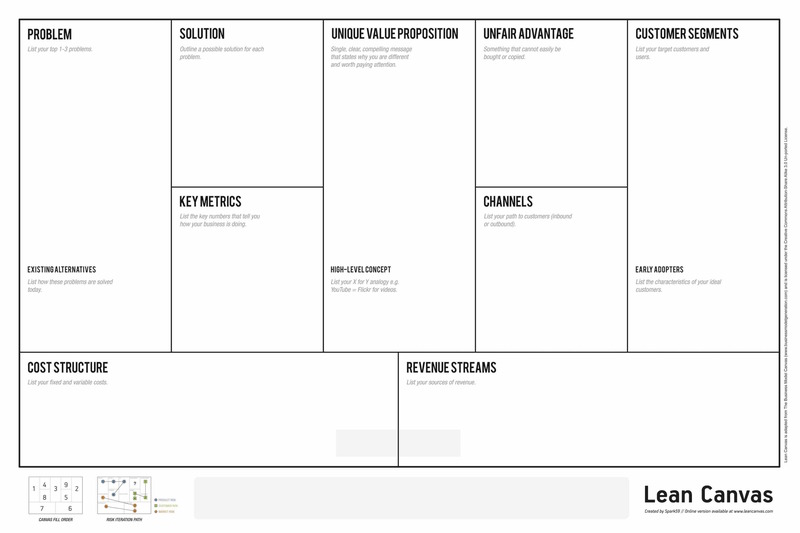 The Lean Canvas is an adaptation of Business Model Canvas and it is especially designed for entrepreneurs. The canvas focuses on problems, solutions, key metrics and competitive advantages. When the Business Model Canvas was introduced, all examples shown were business models from existing and mature businesses. Therefore Ash Maurya redesigned it and created the Lean Canvas that is more actionable and entrepreneur-focused. The Lean Canvas includes aspects for startups to deal with uncertainty and risk. He added the elements Problem and Solution as well as Key Metrics and Unfair advantage. The Lean Canvas also reflects the principles of the ”Lean Startup” approach build-measure-learn. The idea behind the Lean Canvas is to quickly sketch the business idea instead of using several weeks to develop a business plan. The Lean Canvas is divided into 9 components. Before you get started the main question is: Do you have a problem worth solving? If so the first step is to brainstorm who could be your customer or user: define 2-3 specific and small customer groups. Customers are those who pay for your products. In comparison to the business model canvas, the Lean Canvas is designed to focus on one customer group. Therefor create a separate Lean Canvas for every customer group. Based on the identified problems, ideate and define a solution to every problem: list the three most important features for a solution. The Unique Value Proposition is a clear message that describes the advantages of your offer, what makes you different and distinguishes you from the competition. What are the channels you want to use to reach your customer? Define inbound channelsthat lead customers to your offer like SEO, white papers, blogs, social media – and outbound channels like ads, calls, fairs and conventions. BE CREATIVE! Define the revenue streams and the prices for your offer. The pricing is part of your offer and needs to be designed and tested. Use different business model patterns as a source for inspiration. List the most important costs for your offer. This might influence the pricing. As a last step, define your Unfair Advantage: what makes you unique that is not easily copied? E.g. reputation, unique brand experience, unique partnerships that lead to an offer that cannot be copied. Focusing on solving a real problem helps to create sustainable businesses and an empathy-driven value proposition. Revenue streams and costs need to be defined. This is a crucial factor in order to create a financially sustainable business model. The question about the unfair advantage helps to create a business that can survive in a competitive environment. Nevertheless, this should be thoughtfully designed and not exclude cooperation, co-creation and open business models. Leanstack: Why Lean Canvas vs Business Model Canvas?